This is one of the most ideal bamboo available. It is drought tolerant and adapts to almost all planting sites. Some call it "bullet-proof" bamboo because of how tough it is. The canes emerge green and turn a beautiful gray. 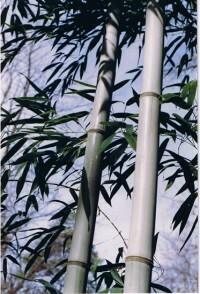 The distinctive looking culms are gray-blue or whitish green, rough to the touch with beautiful dense foliage of green leaves. Climate Zone 7 and above expect mature size canes to be over 60 feet in height. Climate Zone 6 expect mature size canes to be over 40 feet in height. Many call this the 'Mother Form' of Nigra. Its moderately thick culm walls allow it to withstand our winter storms with very little breakage. Typical diameter is about 2-4 inches wide. Phyllostachys nigra, a native of China, is one of the most popular choices of ornamental bamboo in both the United States and Asia. 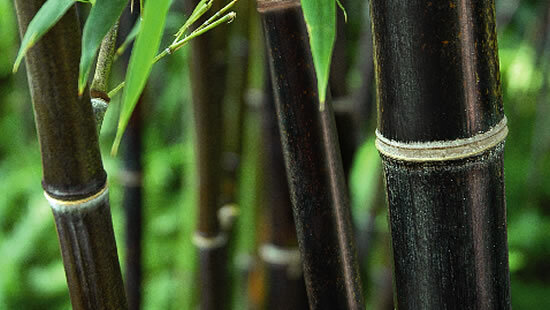 The culms start out green in color, eventually becoming completely black - making for a great backdrop to all that green foliage in the garden. Plants look good growing with shrubs, particularly evergreens in a large border or foliage garden, but can also be grown as a single clump in a lawn. The dark culms contrast with the light green leaves, making this species especially eye catching in the garden. The canes typically reach a width of about 2" when mature.